Upton Park snooker, but in 2004 he was challenged by Big Pete to try 9-ball at the Mile End competition and has never looked back. 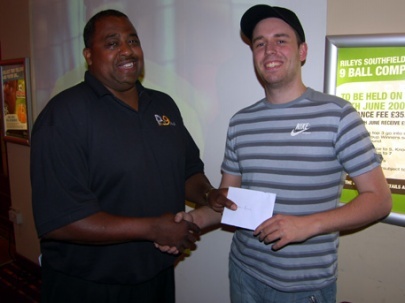 Stephen has won won the Mile End 9-ball competition over 10 times and is a competition regular . Due to his layed back nature and often comical play nobody ever has a bad word to say about him. Stephen is also a Regular player on the GB9 Tour with 1 final win in the challenge cup. Stephen "shows us the money" after another win in the Mile End Ivitational 9Ball competition. Stephen can only make the semi's this time at the R & B open.